But now US-based Uber, Google-backed Go-Jek and Singapore’s Grab are locked in a race for ride-hailing app supremacy in Southeast Asia’s biggest economy, denting the fortunes of traditional three-wheeled bajaj taxis that once ruled Indonesia’s roads. “Our income has fallen between 70 and 80 percent since ride-hailing apps came on the scene,” said Zainuddin, who like many Indonesians goes by one name. There were about 14,000 bajaj on Indonesia’s roads by 2015, according to the latest official figures. By contrast, Go-Jek alone claims 900,000 drivers and about 15 million weekly active users. It launched in 2010. Google and Singapore’s sovereign wealth fund Temasek have announced investments in Go-Jek, which has been valued at as much as $5 billion, although it is little known outside Asia. Southeast Asia’s ride-hailing market more than doubled in two years to about $5 billion in 2017 and is expected to reach $20 billion by 2025, with Indonesia set to account for 40 percent of the figure, according to research by Google and Temasek. Go-Jek, which also reportedly won funding from Chinese Internet giant Tencent, has said it is considering an initial public offering as it looks to grow in Indonesia and beyond. That could inflate its army of motorcycle taxis, private cars and other services — from massage and house cleaning to grocery shopping and package deliveries — all available at users’ fingertips. Dragging behind its regional rivals, Uber is reportedly selling parts of its Southeast Asian operations to rival Grab in exchange for a stake in the Singaporean company. The ride-hailing trio offers fixed-price rides that take haggling out of the equation, a welcome change for former bajaj customer Tetty Iskandar. “I haven’t taken a bajaj in years,” said the 35-year-old housewife, who used to ride the three-wheelers to go grocery shopping. The vast archipelago of about 260 million people has a relatively low per-capita car ownership rate. Vehicle owners often choose to leave their ride at home, opting instead for a fixed-price motor-cycle that can zip through Jakarta’s epic traffic congestion — at bargain-basement prices. That is threatening bajaj — not to mention standard cabs and ubiquitous motorbike taxis known as ojek — which arrived in Indonesia during the 1970s. The motorized rickshaw quickly made inroads under its namesake company, which hailed from India. The name bajaj is now part of Jakarta’s lexicon after supplanting traditional bicycle taxis. A distinctive blue model of the vehicle is still a common sight, and while pollution-spewing older models are outlawed, some still ply the narrow alleyways of Indonesia’s sprawling capital. Government efforts to reduce traffic by reintroducing bicycle taxis could further chip away at the market share of bajaj, which cannot operate on highways. Bajaj backers say the tiny tuk-tuks are safer than motorcycles, which have higher injury and fatality rates. 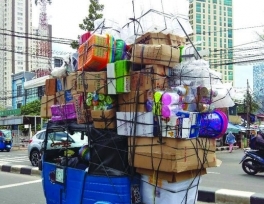 “They are still a very useful means of transport when you have to go through small alleys and roads in Jakarta,” said Danang Parikesit, president of the think tank Indonesia Trans-portation Society. 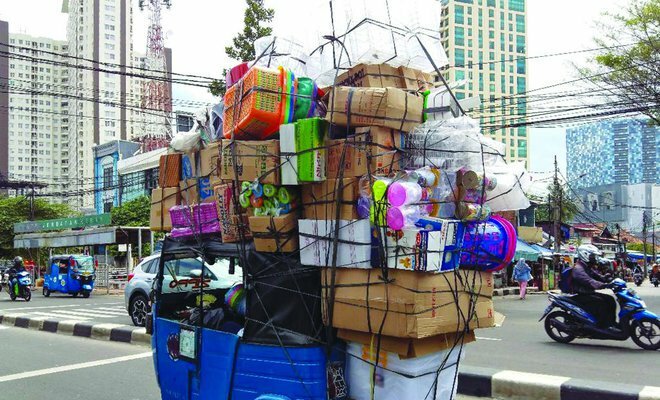 For some, sitting in a tuk-tuk as it teeters and rumbles over Jakarta’s roads offers a connection to an older way of life. “Riding bajaj has a unique sensation, a nostalgic feeling,” said long-time customer Budiyanto. In central Jakarta, bajaj line a curb, their drivers smoking or sleeping as swarms of motorbike drivers sporting Go-Jek or Grab windbreakers zip by on their way to collect customers. Even if they wanted to switch to ride-hailing apps, it is too late for some older drivers. “I cannot shift to an app-based motorcycle taxi because of my age,” said driver Sutardi. Despite the threat of technology, some insist bajaj have a future, especially among customers who don’t want to get soaked on the back of a motorbike or while waiting for a hired car during the months-long rainy season. “Customers don’t like to get wet,” tuk-tuk driver Zainuddin said.